Tomorrow my baby girl turns SIX! It's hard to believe just six years ago our lives were changed forever. It's been nothing short of a blessing to see a screaming newborn with a full head of hair turn into an amazing school-aged young lady. I sometimes look over at her and see no trace of the little, chunky toddler I once knew. Then sometimes I look over at her and see a glimpse of childish innocence that reminds me that my little girl hasn't aboandoned me completely! In her six years, we've had our share of birthday parties...at home and at various "party" locations. 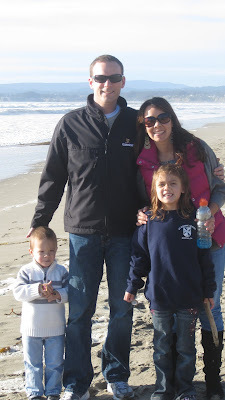 However, thus far our favorite birthday "party" was her 4th birthday when the 4 of us went to Monterey and spent the weekend at the Aquarium and touring around the area. So when I asked her if she would like another "destination" birthday, there was nooo hesitation at all! And this year, I suggested that we go with another family so we could share the experience. This year's destination of choice was the Big Sur/Santa Cruz area and the Seascape Beach Resort...an awesome all-suite "hotel" right on the beach. Unfortunately, our friends came down with the puke flu a few days before the scheduled trip and were unable to attend which was a huge bummer, but we still had an awesome time!!! From strolling the pier, playing on the beach, a swim in the heated pool and even a nighttime beach bonfire...it's safe to say we all had a wonderful weekend. I can't tell you how pleased I was that I didn't have to host ten 6 year olds, do dishes or spend the day at Chuckie Cheese..it was honestly a vacation for ME, as well! As we were checking out Brookey asked, "Can we come here for Buddy's birthday, too?" Absolutely. What's better than cotton candy?! 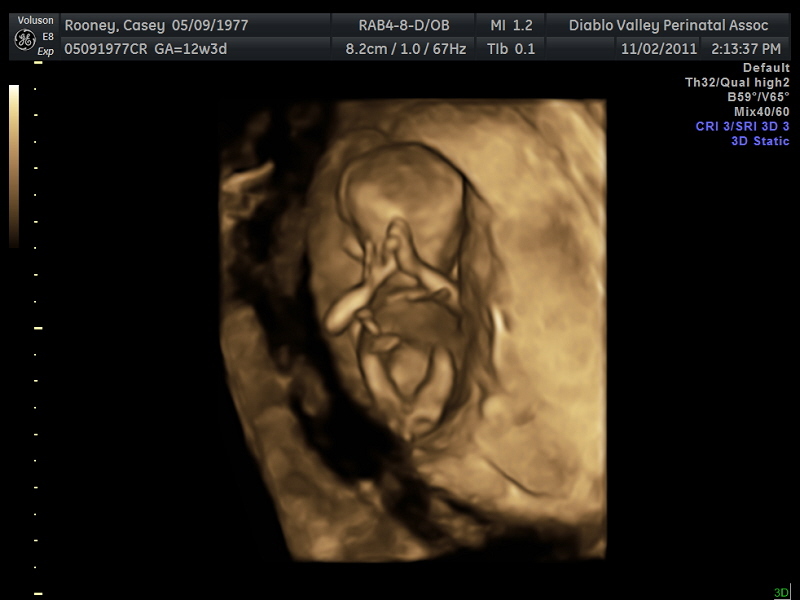 Here's the latest of Baby 3, flipping off the the camera for your viewing pleasure. This picture was taken for the NT Scan, which is a screening for Down's Syndrome (among other things). My stomach was in knots yesterday. Almost 3 years ago the same Dr. told me that Will (then, "Baby 2") was high risk for Downs. Obviously, everything turned out fine but needless to say, I WAS NOT at all excited about this appointment. This experience was MUCH, MUCH better, the Dr. telling me that "everything looked more than perfect!" Now, those are words I want to hear!! 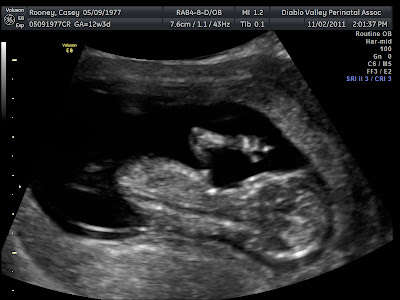 Here are some more shots from the ultrasound. They even showed me the 3D version which completely FREAKS me out. I really don't need that much information :) But I have to admit, it was pretty incredible. It really is a miracle from above!! 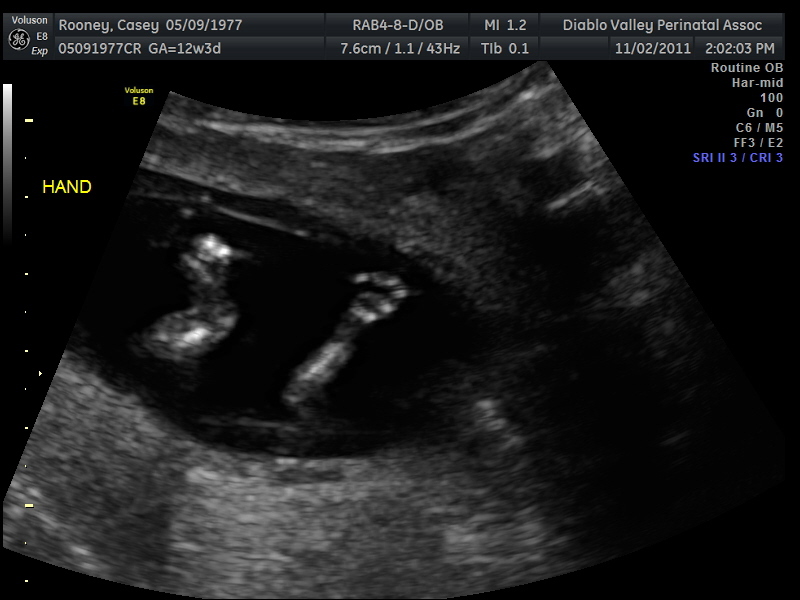 Little Hands--they could count the fingers and toes, even at 12 weeks-amazing! 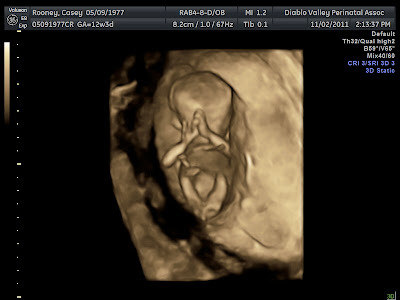 He/She already knows how to pray!! I was told there was no way you could tell the gender from this shot or at this point.